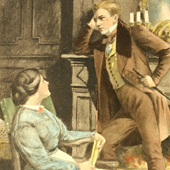 Praised by novelist Virginia Woolf as “one of the few English novels written for grown-up people,” Middlemarch has reigned for more than a century as one of the most powerful and affecting novels in the English language. A serious study of self-delusion and gender-dynamics, George Eliot’s last novel is also a wonderful window into the human soul. This is a book within which to become lost and also found. Guide: Sara Guest is a literature editor/producer and poet whose previous jobs have included editor for Encyclopaedia Britannica, producer for Harpo Studios (Oprah’s Book Club) and program coordinator for Write Around Portland. She is currently a visiting writer at Pacific Northwest College of Art and an author coordinator for Wordstock. Sara has an MA in English from Case Western Reserve University with a focus in the late-Victorian and early-Modern periods.